I am on a appetizer kick lately and was jonesing for some good ‘ol Hawaiian style pupus. Poke is without a doubt the biggest thing I miss about the islands and unfortunately have a very difficult getting my hands on any decent Ahi or tuna that would do the dish justice. If you are ever on Oahu and want to try what I consider to be the best poke on the island I strongly suggest you check out JJ’s Seafoods on Kamehameha Highway in Kaneohe. It is run by an elderly couple and these people know their poke. If you stop by tell them Cole sent you and they might just hook you up with a free bag of boiled peanuts, another island specialty. The coolest thing about poke is that there really aren’t any rules. I’ve seen poke made out of ahi, marlin, salmon, mussels, octopus, scallops and even tofu! Normally the main ingredient (any of the above) are cubed into 1/2 inch to 3/4 inch pieces and then mixed with a wide range of ingredients (ie. ogo or limu (crunch seaweed), green onions, sweet onions, sesame seeds and/or oil, cukes, soy sauce, chili peppers, hawaiian salt, kim chee base, etc.). Poke is truly indigenous to the islands and couldn’t go any better with a cold brew. Ahhh…I can almost feel the ocean breeze. 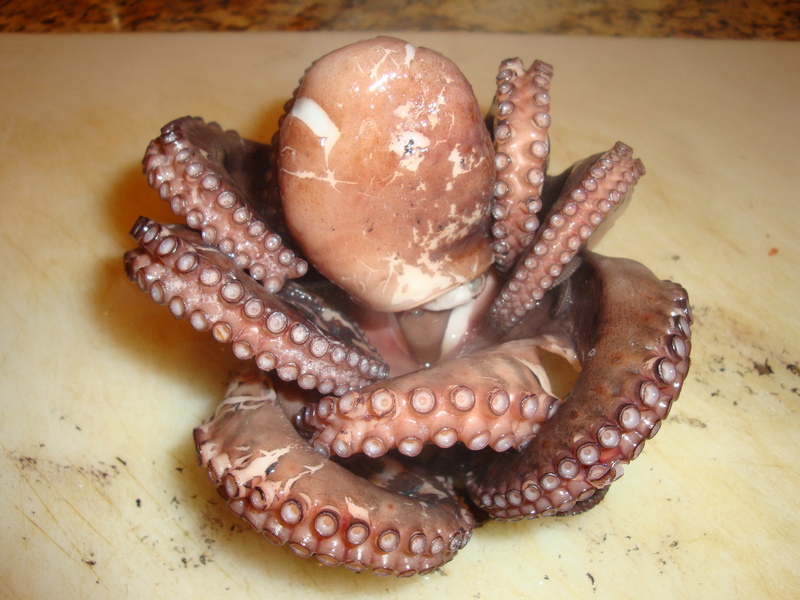 While persuing our local Asian market, Lee Lee’s, I found whole frozen octopus or tako if you are in Hawaii…not to be confused with a taco…big difference. 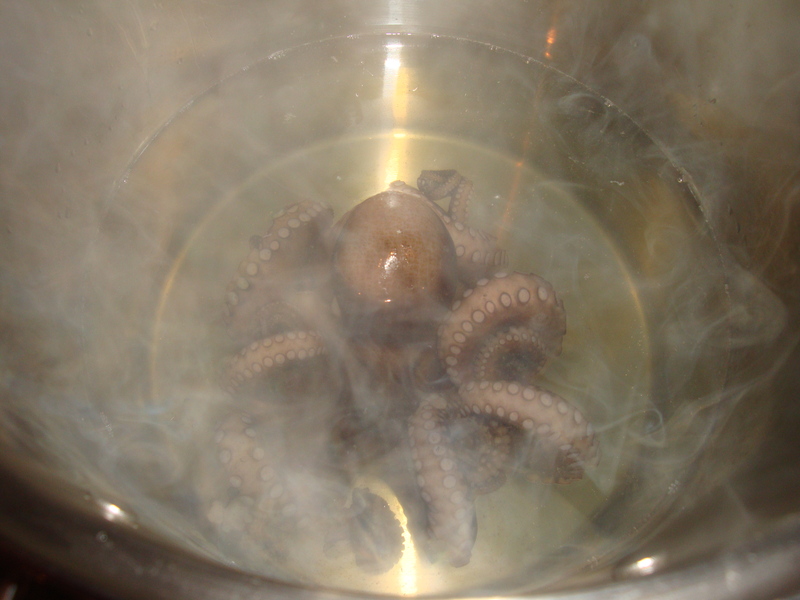 The great thing about tako is that freezing it doesn’t jack it up like freezing ahi does. 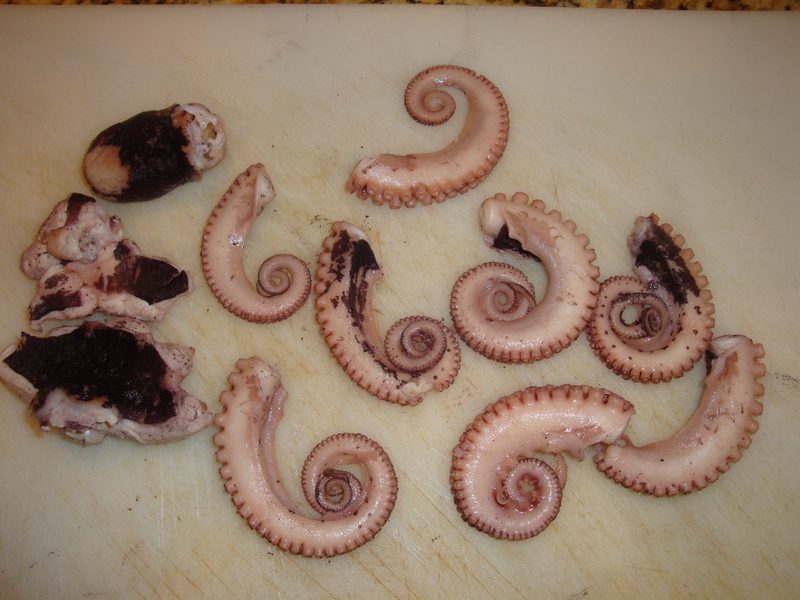 In fact freezing tako improves the chewy flesh and helps make it a little softer. There are tons of web based suggestions ranging from boiling it in beer or sake to adding a few wine corks to the boil. After deliberating I decided to soak it in some salt water for about 4 hours (changed it 3 times). After the soak I put it on cutting board and proceeded to give it pretty good pounding with my meat mallet. This is supposed to further break down the chewy flesh. In Hawaii some of the locals that catch plenty tako actually have cement mixer that which they use solely for the purpose of tenderizing the tako. Others place it in a five gallon bucket with some Hawaii salt and use their hands to tenderize it. After the pounding I put it into a pot of salted boiling water and boiled it for about 45 minutes until it completely changed colors and took on a reddish type color. After removing from the water I wiped it off and began disassembling the legs from the body. 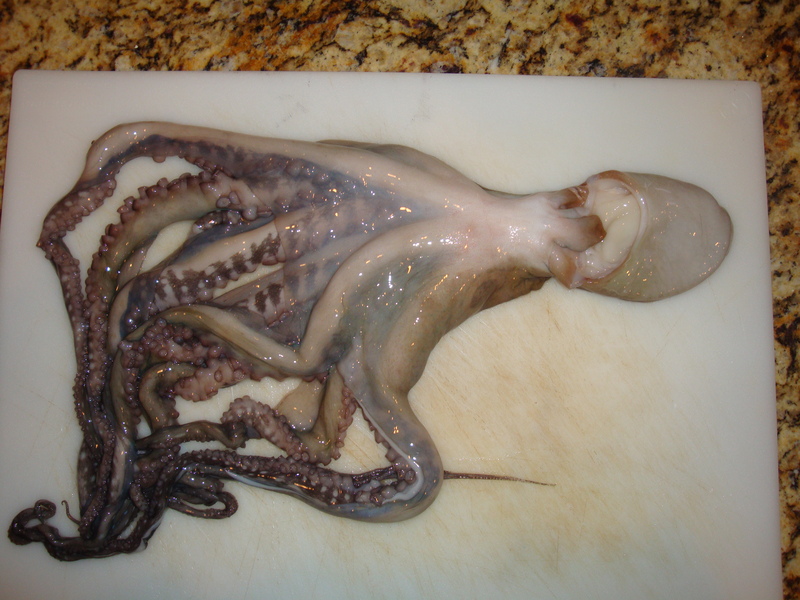 Next, I sliced the legs into thinn slices and did the same with the head and body and placed them in the bowl. Then I assembled the ingredients that I was going to add to the tako for my poke. I had some kim chee base which is traditionally used to make Korean style Kim Chee (spicy fermented/pickled vegetables), some green onions and sweet onions. Later I decided to add some sesame seeds and a tablespoon of sesame oil. 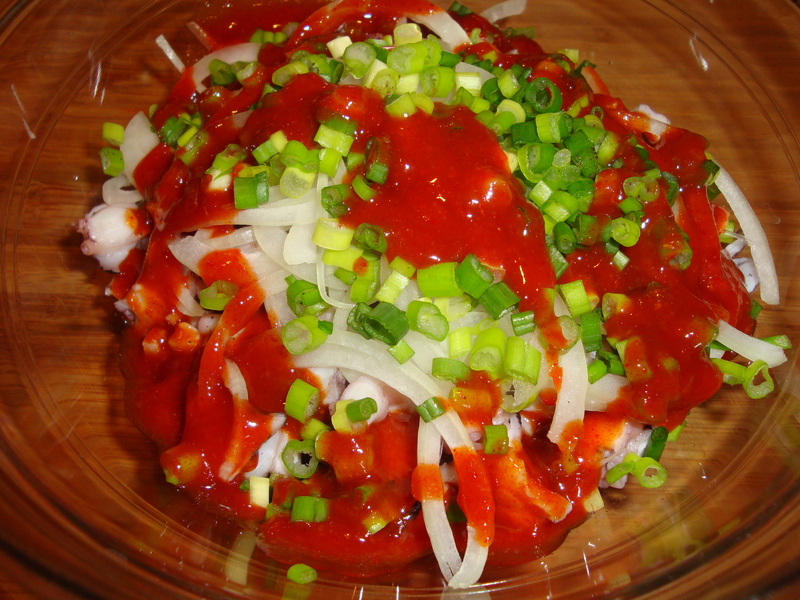 Kim chee tako poke...bring on the brews! 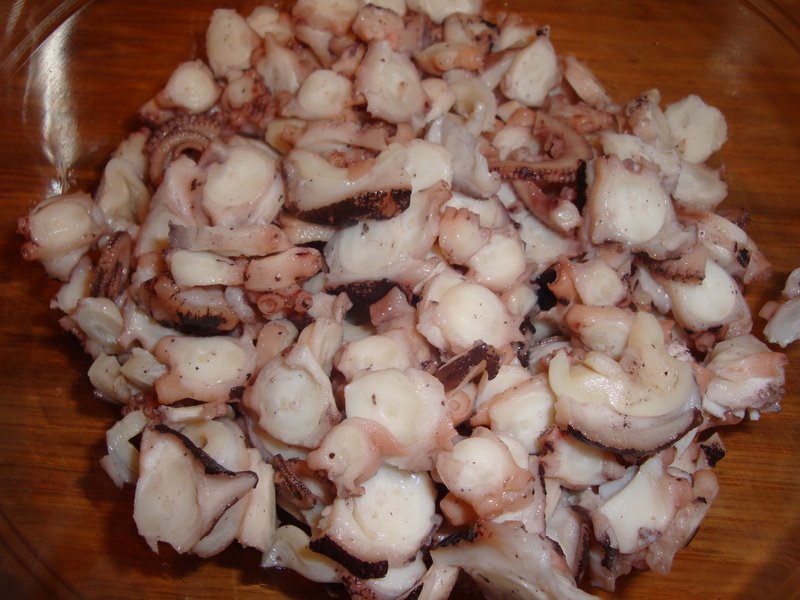 After I mixed my ingredients together I added it to the tako and tossed until thoroughly coated. 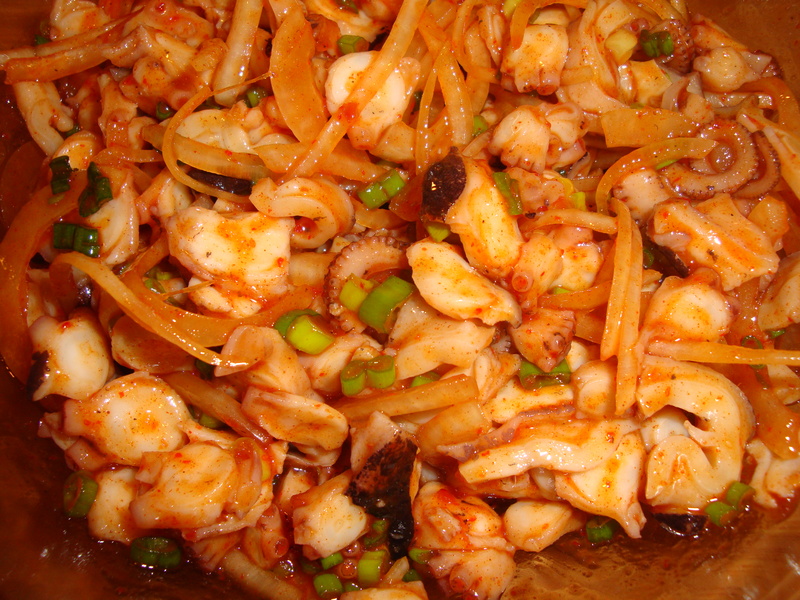 Voila…Kim Chee Tako Poke. Give this dish a shot and I guarantee you won’t be disappointed. Eating my way through LA!